The Forbidden City became more popular this year in the otherwise freezing off-season because of an ongoing New Year exhibition, the museum's largest with 885 relics. 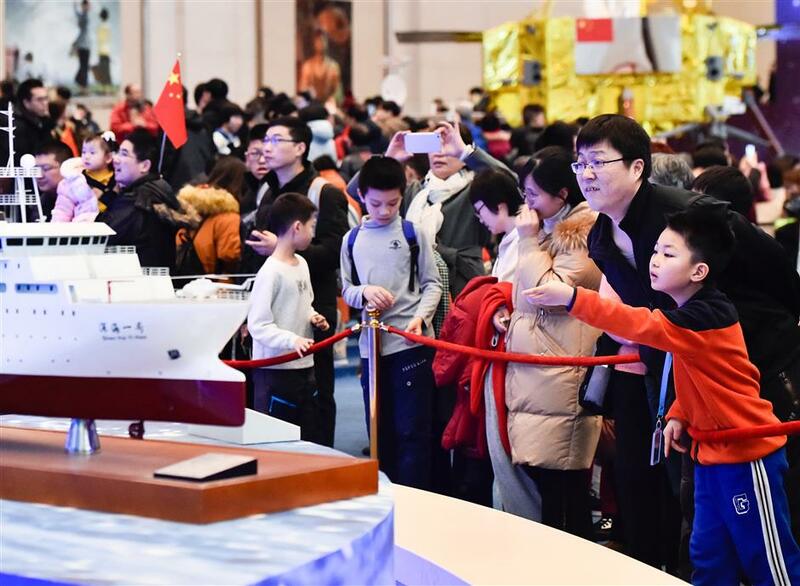 People visit an exhibition to commemorate the 40th anniversary of China’s reform and opening-up in the National Museum of China yesterday in Beijing. The museum staged a series of exhibitions during the Spring Festival, attracting more than 60,000 visitors a day. “I didn’t expect a museum ticket to be as popular as a train ticket during the Spring Festival,” said Zhang, a college teacher from northeast China’s Liaoning Province. Zhang was spending his first weeklong Spring Festival holiday in the Chinese capital, together with his wife, father and mother-in-law and his 4-year-old son. The former palace, which admits 80,000 visitors per day, became more popular this year in the otherwise freezing off-season because of an ongoing New Year exhibition, the museum’s largest with 885 relics. The exhibition aims to provide an immersive royal experience for visitors with the entire Forbidden City adorned with newly-restored ancient royal lanterns and spring couplets. These include a rare collection of the Chinese character “Fu,” meaning happiness and good luck, written by five Qing Dynasty (1644-1911) emperors. “Luckily, we’ve got a plan B,” said Zhang, pointing to the adjacent National Museum of China. The NMC was staging a series of exhibitions attracting a record of more than 300,000 visitors during the five days from Tuesday to Saturday. Among them was an exhibition to commemorate the 40th anniversary of China’s reform and opening-up, which was launched in November, and a display of the Bronze Tiger Ying, a looted Chinese bronze vessel recently brought home. Locally, people queued in long lines in front of the Shanghai Museum even before the doors were opened. A pig-shaped bronze vessel, which dates back more than 3,000 years, is on display for the first time at the museum. “There has been a marked increase in museum visitors during the Spring Festival since 2015,” said Guan Jun, who has been a museum volunteer for six years. Guan attributed the increase to improvements in curating, promotion and service as well as stronger public recognition of traditional Chinese culture. In central China, the Henan Museum received about 8,000 visits on February 6, the second day of the Chinese New Year, two times the figure of a regular weekend day. China’s 5,136 museums saw nearly 1 billion visits in 2018, figures from the National Cultural Heritage Administration show. Shan said he hopes more Chinese could put museum tours on their must-do Spring Festival list alongside the Lunar New Year Eve family reunion dinner, annual TV gala and watching films.